In this easy-to-read, search-and-find story, Tate draws cats, bugs, and birds--but he never draws Pup! Tate likes to draw. He draws 10 cats on the couch, 10 bugs in the garden, and 10 birds in the park. Pup, who craves attention, is never in Tate's pictures. Pup is very upset, so he runs away to join the circus. Tate misses Pup and draws many, many pictures of the dog to hang all over town. Tate and Pup reunite, and now Tate will always remember to draw Pup. 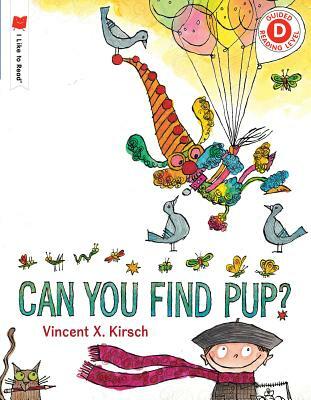 While reading the story, readers can search for cats, bugs, birds, and Pup. VINCENT X. KIRSCH is an artist, designer, toymaker, and writer of books, film, and television projects. He has illustrated ten children's books, some of which he also wrote.